Dominion had a dismal second season, losing nearly half of it’s viewers from Season 1 and averaging only 0.9 million viewers. From my point of view, the diverging subplots seemed irrelevant compared to the main plot of Alex, the writings and what it meant to the humans and angels, which seemed to take all season only to move slightly. However, the addition of Lucifer was actually peaking my interest level at the end. Michael, after his rampage against humans, travels far away to Alabama, where he encounters a small town that says the Father speaks to them there and they are protected from the 8-balls, while Alex and Uriel are held captive in Gabriel’s aerie, trying to force Alex into decoding the writings on his body. Claire Riesen, after the departure of her father for Delphi, has control of the armies of Vega and continues to be at odds with Senator Whele over the V-System when she gives more resources to the Level 1s, and decides on an opportunistic attack against Gabriel. The season premiere packs in a lot of action…tune in tonight at 10/9c! Syfy’s sophomore series Dominion is adding new characters, and a new composer as well. Production is underway in Cape Town, South Africa for the 13-episode second season. Joining the series’ stellar cast are recurring guest stars Nic Bishop (Covert Affairs), Simon Merrells (Spartacus: War of the Damned), Christina Chong (24: Live Another Day), Olivia Mace (Doctors) and Luke Tyler (Chronicle). In addition, Bill Brown, who scored all nine seasons of CSI: NY and countless video games (including Marvel’s Captain America: Super Soldier, for which he was nominated for Best Original Music for the orchestral/electronic hybrid at the Canadian Video Game Awards), and has been known to beta test cutting edge technology, will score the second season of Dominion, and he’ll soon be exploring the capabilities the new reissue of Moog Music’s classic synthesizers from the golden age of electronic music. Season 2 of Dominion is set to premiere on Syfy in Summer 2015. Syfy has announced that they have given a 13 episode third season order for Defiance, as well as a 13 episode second season for Dominion. Both series are produced by Universal Cable Productions and are slated to return with all-new episodes in 2015. On the season finale of Dominion, Alex and Gabriel finally meet face-to-face, while Michael recalls his darker days with Alex. 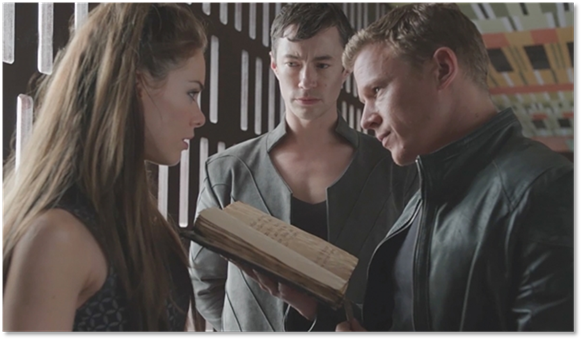 Check out the sneak peek below along with “Inside Dominion” – and as an added bonus, check out the SDCC panel as welll! Then tune in for “Beware Those Closest To You” Thursday night at 9/8c! On tonight’s new episode of Dominion, Michael and Alex try to prevent any further causalities after innocent angels turn up dead in Vega. Meanwhile, Claire makes a difficult decision. Check out the sneak peek below along with the latest “Inside Dominion”, and tune in tonight at 9/8 for “Ouroboros”. In tomorrow night’s Dominion, Alex begins his training with Michael while David uncovers a secret involving Claire. Watch the sneak peek below, as David recalls a horrific memory about his family, and tune in Thursday at 9/8c for “Something Borrowed” – and don’t forget to check out “Inside Dominion” below as well. Check out this short preview of tonight’s new episode of Dominion, “Broken Places”, as well as “Inside Dominion“, and tune in tonight at 9/8c on Syfy!